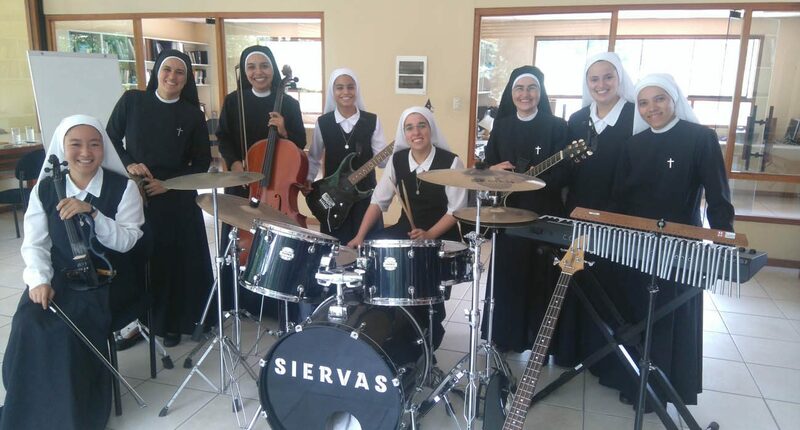 LIMA, Peru (CNS) — When people wave at members of the pop band Siervas as they drive through the city, the nuns in the musical group know they’ve arrived on the world stage. It’s a delicate balance for the sisters to juggle their social ministry and their musical passion. “Monday and Friday afternoons are for group rehearsals and most of the nuns practice every day as well. But we also visit three different jails one morning a week, work in schools, with the homeless and people with physical handicaps, as well as with a children’s home for young people who have parents in prison or who can’t look after them,” Sister Monica said. “It felt absolutely amazing singing to so many people. I am not sure if we will ever play to that kind of audience again” Sister Monica said. The combination library and music room where Siervas rehearses is filled with instruments: cellos, bass guitars, keyboards, speakers and a large drum kit. As the sisters warm up, they introduce themselves. Sister Cindy, from Venezuela, studied in a musical conservatory and has played the cello all her life. Sister Camila, from Peru, only started learning the electric guitar a year ago but has shown she’s a natural. One of the lead singers, Sister Yvonne, studied music, and her sister plays the bass guitar. Three members of the musical group are novices and have three years to decide whether religious life is the right path for them; the youngest is 20 years old. The sisters said “Confia en Dios” gets the most attention. The song talks about the difficult moments people have as they go through challenging times and how it is important to remember that those times provide a sense of God’s plan. As for their musical career, the sisters said it is God who guide the group’s direction, as long as they continue to have the time to carry out their much-needed ministry of service to the people in the communities around them.